I made this recipe for the first time many years ago, it was a Sunday, I was a little hungover and very hungry, all I had in was some pork, a bottle of cider, an apple and some veggies. So I threw it all together and ended up with this!! I made it again for my Aunt and Uncle and they loved it, in fact she now cooks this dish more that I; I even had to call her up to remind me of what I did! I have used Pear in the recipe below, but you can use apple as I originally had, the great thing about stews is that you can put whatever vegetables in which you might have. I used butternut squash rather than potatoes, but the choice is yours! Add the tablespoon of flour to the pork and season really well with lots of salt and cracked black pepper. Heat a little oil in a frying pan. Fry the pork in batches until browned then set aside. The reason I floured the meat at this point as it will add thickness to the stew later on and the meat will brown nicely. Meanwhile in a large ovenproof pan heat a little oil, add the onion and celery and soften. Add the pear, carrots and sage and cook for a few minutes more. Now pour some of the cider into the hot frying pan that you browned the meat in to de-glaze, then pour this into the pan with the carrots and onions, then add the rest of the cider. Make sure your cider covers your veggies; if not add a little water. Pop a lid on and place into the oven for about 30 minutes, after this time check the meat is nearly tender. Add the butternut squash, courgette and mushrooms. Stir. Continue to cook covered in the oven until the meat is tender, should be about 1 hour. 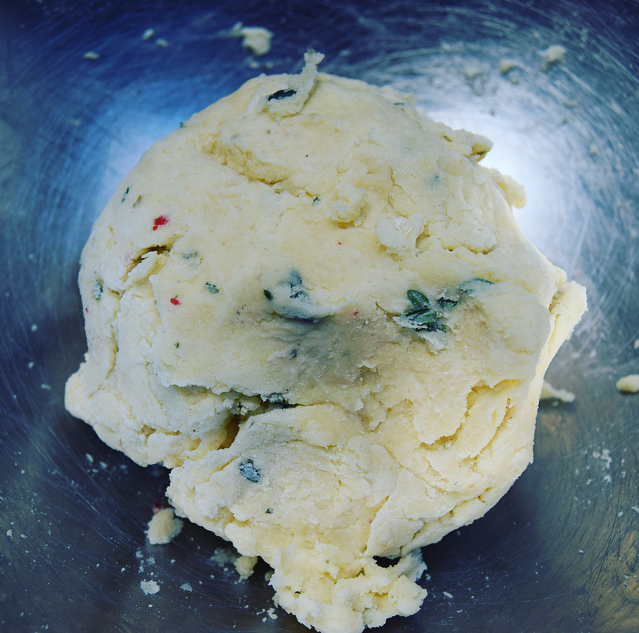 Pop the flour and baking powder into a bowl and season with a pinch of salt, along with the chopped herbs. Grate the cold butter into the bowl. 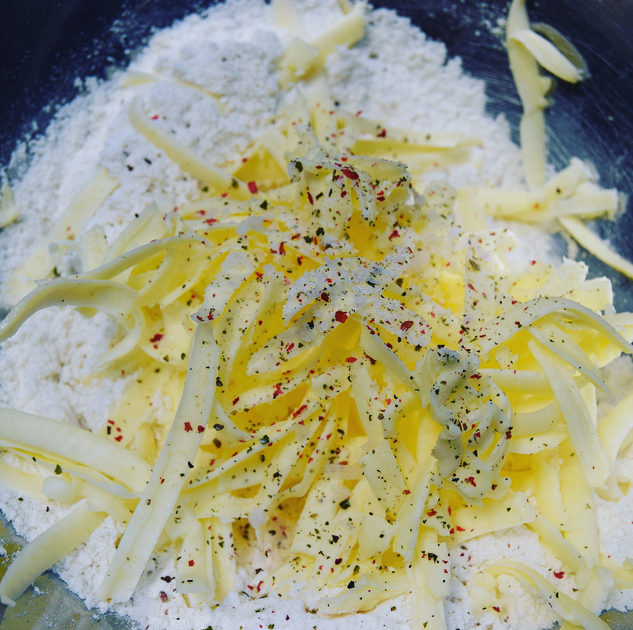 With your fingers rub the mixture together to create breadcrumbs. 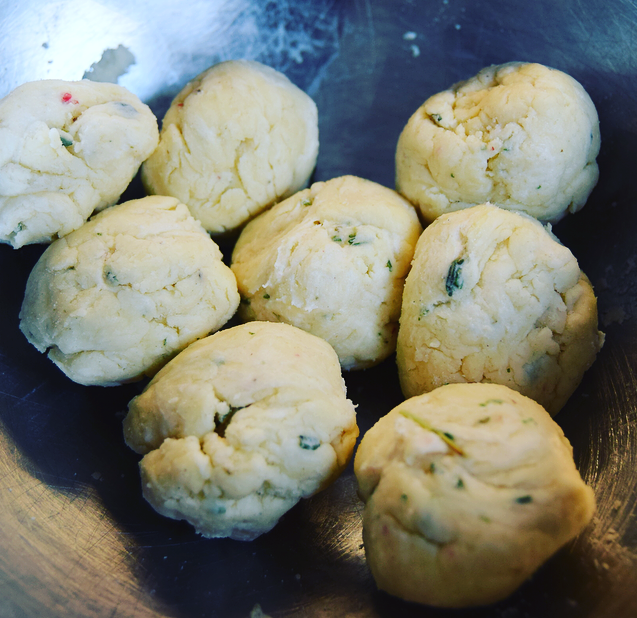 Once breadcrumbs are created add drizzles of cold water, just a little at a time to bring the mixture together to create a dough. Place the balls evenly over the stew, place back into the oven for 20 minutes uncovered. This will let the stew also reduce a little, create good colour and the dumplings will be soft on the underside and crispy on the top. 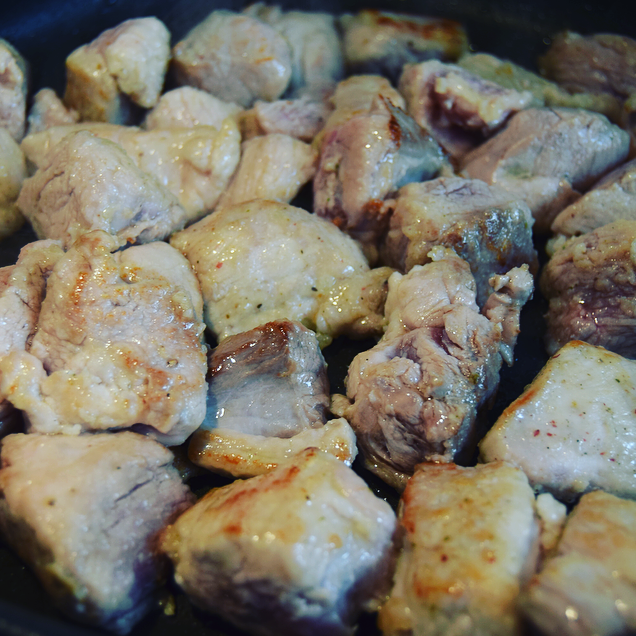 Add the tablespoon of flour to the pork and season really well with lots of salt and cracked black pepper, then heat a little oil in a frying pan. Fry the pork in batches until browned then set aside. The reason I floured the meat at this point as it will add thickness to the stew later on and the meat will brown nicely. Now pour in the cider. Looks delicious, definitely something I will have to try out for myself one day….